Ayanna Howard, professor of electrical and computer engineering, and graduate student Hae Won Park have created Access4Kids, a wireless input device that uses a sensor system to translate physical movements into fine-motor gestures to control a tablet. The device, coupled with supporting open-source apps and software developed at Georgia Tech, allows children with fine motor impairments to access off-the-shelf apps such as Facebook and YouTube, as well as custom-made apps for therapy and science education. The current prototype of the Access4Kids device includes three force-sensitive resistors that measure pressure and convert it into a signal that instructs the tablet. A child can wear the device around the forearm or place it on the arm of a wheelchair and hit the sensors or swipe across the sensors with his or her fist. The combination of sensor hits or swipes gets converted to different “touch-based” commands on the tablet. Children with neurological disorders such as cerebral palsy, traumatic brain injury, spina bifida and muscular dystrophy typically suffer from fine motor impairments, which is the difficulty of controlling small coordinated movements of the hands, wrists and fingers. They tend to lack the ability to touch a specific small region with appropriate intensity and timing needed for press and swipe gestures. The impact of Access4Kids could be significant. More than 200,000 children in the U.S. public school system have an orthopedic disability and have been excluded from tablet and touch screen devices. Current assistive technology, such as Augmentative and Alternative Communication devices, is available to those with motor impairments for traditional computer platforms but not tablets or smartphones. 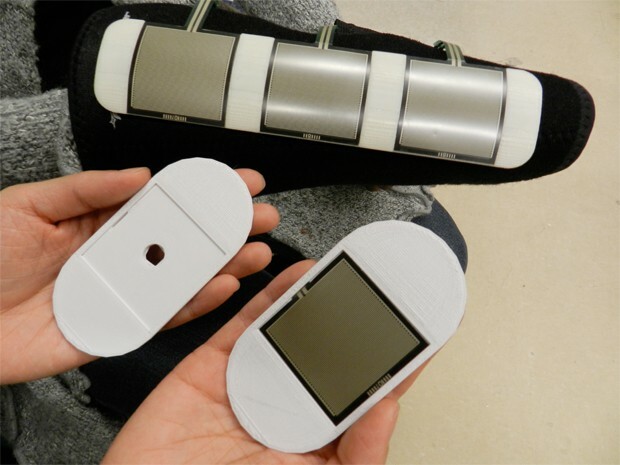 Howard is creating a second prototype that aims to be more flexible. It will include wireless sensors that can be placed anywhere a child is capable of hitting them, such as with a foot or the side of the head. User trials for the second prototype will begin soon. Howard says she hopes to have the device through clinical trials starting next year. So far Access4Kids has received positive feedback from both typically developing children and children with disabilities, as well as caregivers. The device was also a finalist in a recent Intel-sponsored competition and was showcased to the British Consulate prior to the Paralympic games this summer, receiving good reviews. The project was originally funded through the NSF-sponsored Broadening Participation in Computing Program and then through I-Corps, a National Science Foundation program that aims to translate scientific discoveries into useful products for society. Howard is working on a version of the device called TabAccess for adults with motor disabilities. Access4Kids also received a seed grant from the Atlanta Pediatric Device Consortium, a partnership between Georgia Tech, Children’s Healthcare of Atlanta and the Atlanta Clinical & Translational Science Institute that provides assistance with the commercialization of novel pediatric medical devices and technologies.